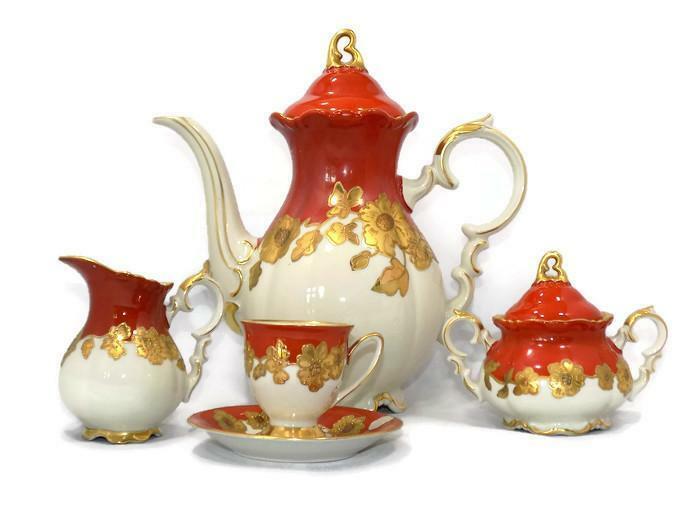 This spectacular hand painted and hand gilded coffee set was made in Waldershof, Bavaria by the Franz Neukirchner Porcelain Works. 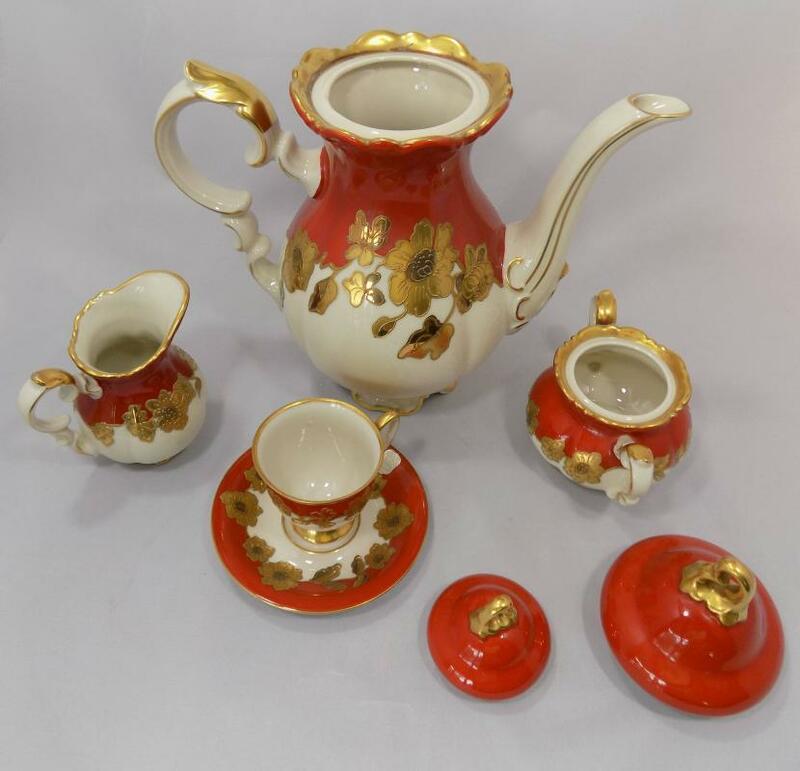 The set consists of the tall pot with lid, sugar bowl with lid and cream pitcher. Also included is a small cup and saucer for the coffee, the size usually used to serve demitasse and espresso-based drinks. 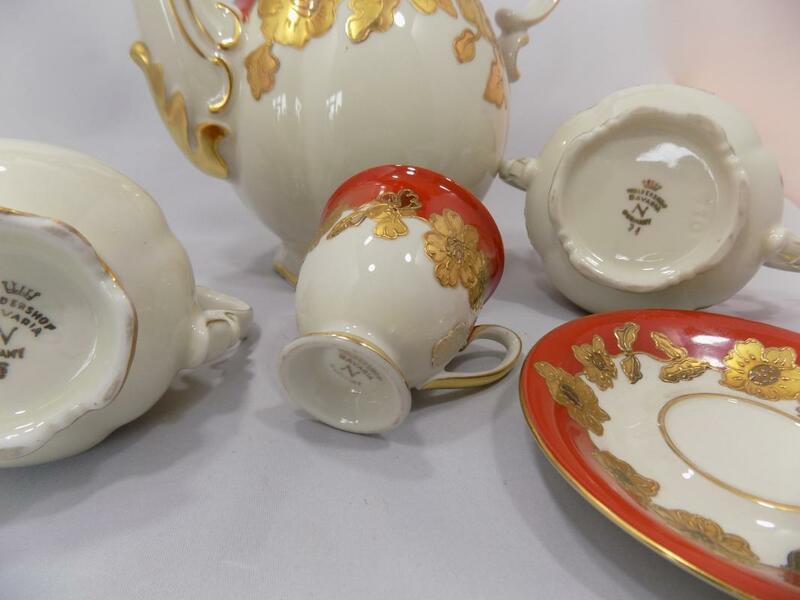 The creamy white bodies are decorated with a color they called "Swedish Red" and have hand applied raised flowers of genuine gold, which also trims the rims, curvaceous handles and lid knops. 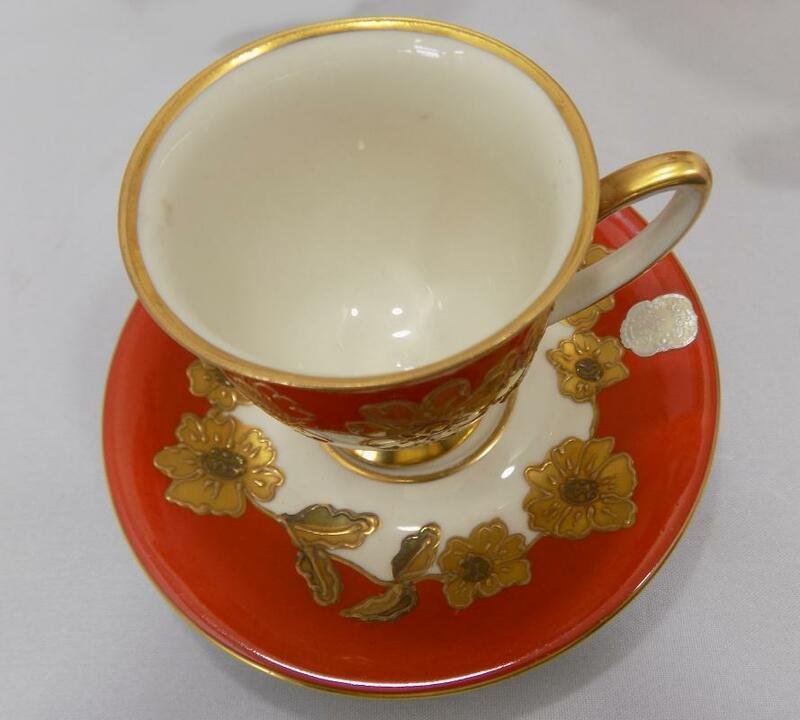 All of the pieces of this set are pristine; in fact, the demitasse cup still retains the original foil label placed on it at the factory (shown in one of our photos), which reads "Echt Gold" with a capital N (for Neukirchner, of course) between the words. "Echt," which is sometimes mistakenly assumed to be a maker's name, simply means "real" in German. The coffee pot stands 10 1/2 inches tall with its lid, measures 10 inches across from spout to handle and holds about 48 ounces (1 1/2 quarts). 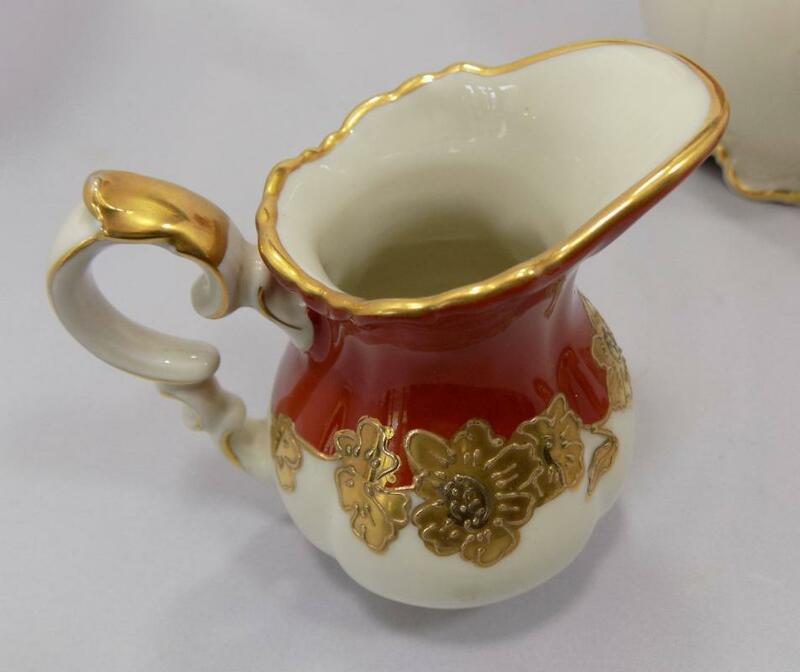 The sugar bowl is 4 1/4 inches tall with its lid; the creamer measures 6 inches in height and holds 6 ounces (3/4 cup). 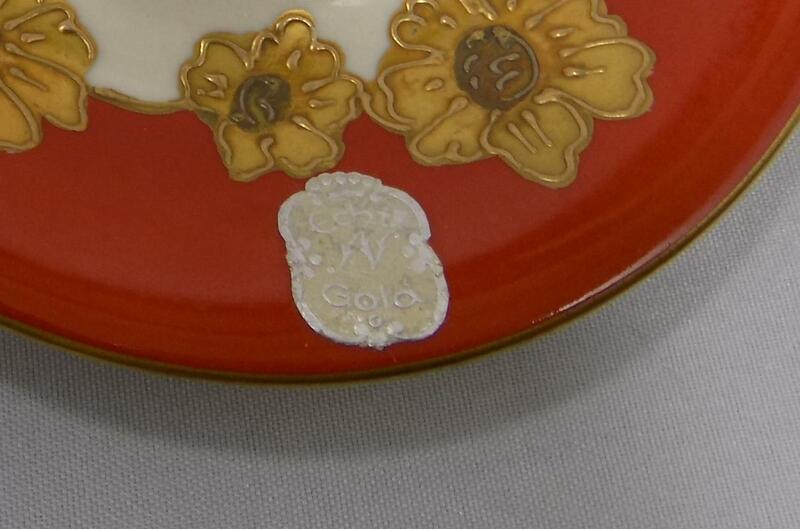 The petite saucer is 4 1/2 inches in diameter; the cup is 2 1/2 inches tall and holds 2 ounces. There are no cracks, chips, hairlines and virtually no wear to the decorations; there are a few brown spots in the bottom of the pot in the crevice, but that's it. This set was deservedly cherished and cared for. 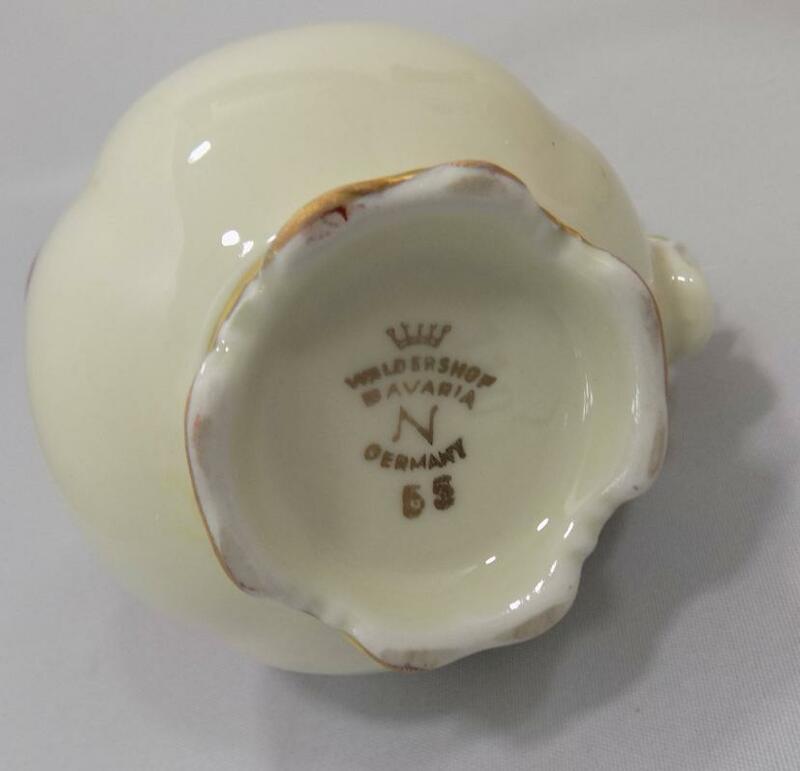 A bit of history on Neukirchner Porzellan: We found a listing for the company in a 1906 Directory of the German Ceramic Industry that indicated the company was in existence since 1890. Also mentioned was that they were highly successful with heavily gilded china. The mark of the crowned N on the bottom of the pieces was one of four they used that we could locate and was used from 1916 until the demise of the company in 1977. 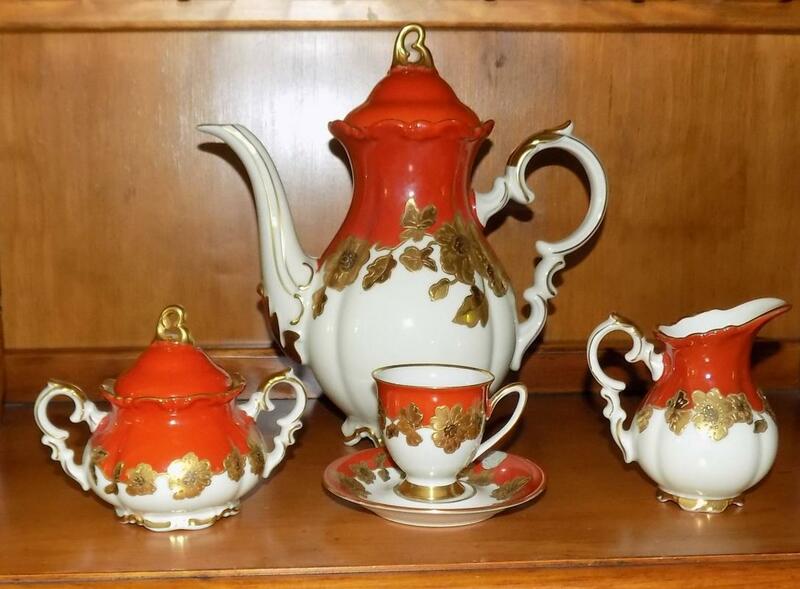 This exquisite Bavarian china coffee set is one that will be the star in any setting.